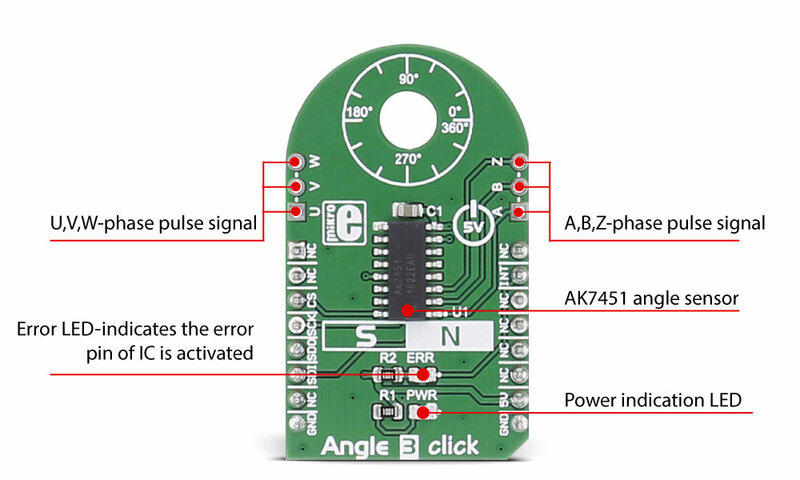 Angle 3 click carries the AK7451, a magnetic rotational angle sensor. The click is designed to run on a 5V power supply. It communicates with the target microcontroller over SPI interface, with additional functionality provided by the INT pin on the mikroBUS™ line. Angle 3 click can be used for non-contact rotation angle measurement. The AK7451 is a magnetic rotational angle sensor with a built-in Hall element. By detecting the magnetic field vector parallel to the IC surface, the AK7451 outputs the absolute angular position of the magnet and the relative angular position. Through the transverse magnetic field detection method, using a magnetic flux concentrator, the AK7451 has excellent axial misalignment immunity. The host microcontroller sends the request for measuring the angle rotation via the SPI interface. The AK7451 sensor responds with the measured data. There are 3 output pins on board (A, B, Z) where the IC outputs pulses for the encoder feature and the 3 output pins (U, V, W) where the IC outputs pulses for the BLDC motor drive.